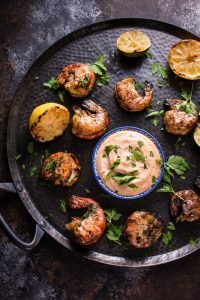 These grilled garlic jumbo shrimp are an impressive and flavorful dish that’s a perfect appetizer for summer entertaining! 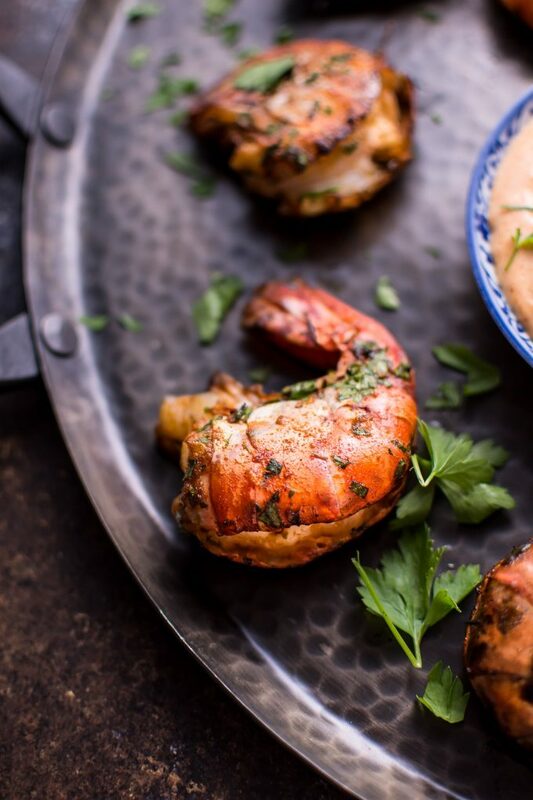 These grilled jumbo shrimp are a great alternative to cooking lobster. No, they’re not the same, but they’re also much easier to deal with, more cost efficient, and they are still pretty nifty. I made a tasty little dip to go with these. I also grilled up a lemon and lime. Grilling them adds an extra dimension of flavor that’s totally delicious squeezed over these shrimp! I added in a pinch of saffron, but I will say that it’s optional if you don’t have any. I like to keep it on-hand since you never know when you’ll need it, but it is rather pricey. How do you prepare jumbo shrimp for grilling? To devein these huge shrimp, the shell has to be cut along its length to expose the “vein” before you use a knife to scrape it out. It’s pretty easy to do that with kitchen shears and a sharp knife. If your shrimp aren’t already deveined, here’s a handy little guide if you’re not quite sure what to do with them when you get them home. Cutting the shell will also help the marinade soak in better. I left the shells on while cooking them. 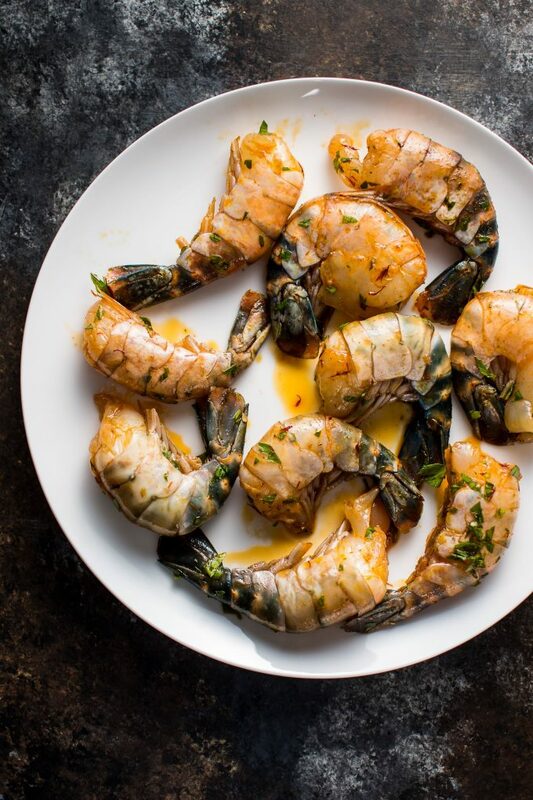 These jumbo shrimp are large enough that you don’t need to worry about skewering them. They’re too large to fall through the grates. 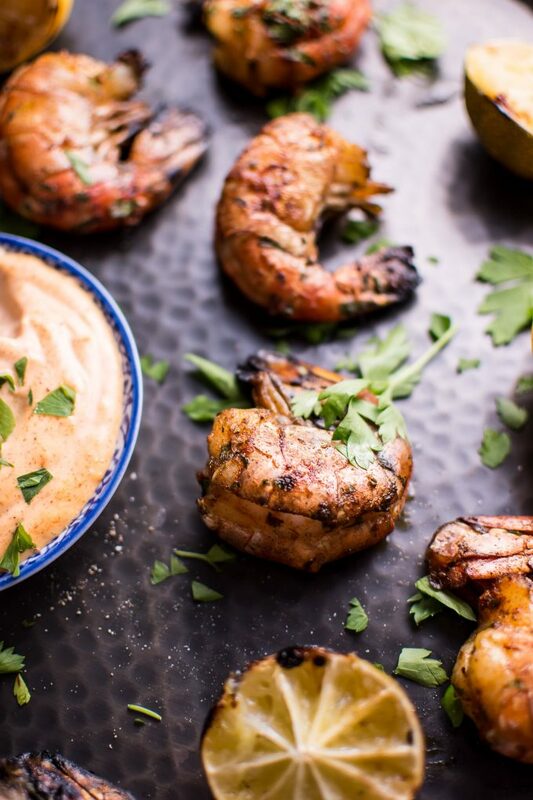 An impressive appetizer of garlicky grilled jumbo shrimp, grilled citrus, and a tasty dip! Prepare the shrimp (thaw & devein if needed, and leave the shells on. Here's a tutorial if you're not sure how to do this). Add marinade ingredients to a bowl and combine. Add half the marinade to a large Ziploc bag. Add the shrimp to the bag and ensure they're coated in the marinade. Let them sit for 15 minutes. Meanwhile, add the dip ingredients to a bowl and stir until combined. You may want to transfer it to a smaller dipping bowl for serving. Refrigerate until needed. Preheat your BBQ/grill to high then reduce the heat to medium-high when you're about to start grilling. Cook the shrimp for about 4-5 minutes/side or until they're cooked through but not overcooked. The outside will turn pink. Make sure you take them off the heat ASAP. While cooking, baste the shrimp with the remaining marinade. Grill the citrus cut-side down for a few minutes (I did until it had nice char marks). You can do this the same time as the shrimp. We use a gas BBQ and cooked everything with the lid down. Serve the jumbo shrimp with the dipping sauce and the grilled citrus. Just a note that depending where you buy the shrimp and what brand they are, the classifications of their size may vary. The ones I bought (16-20/pound size) are sometimes referred to as "ultra jumbo" and I've also seen "gigantico". Serves 4+ as an appetizer or 2 as an entree. Keep in mind every BBQ/grill/grill pan is different. My cooking times are based on a gas BBQ and should be taken as a guideline only. It looks great,and I will try this,mothers day I grilled new yorkvstrip and shrimp,I didn’t know about marinating them,thanks. That’s a really neat story! I had no idea you lived in Nairobi. I was researching shrimp sizes and I actually wasn’t aware that they could get way beyond “jumbo” as well. That’s so funny about your kitty. And I agree, anything much bigger than these starts to get into strange territory. 😛 Hope you get your grill soon! It’s been a game-changer for me. Love this, and I LOVE shrimp. I haven’t grilled them in ages and now you’ve got me all inspired! This makes me wish I was good at grilling, or owned a grill! Haha. That dip sounds AMAZING. This sounds awesome! I’m about to share a shrimp recipe too! But your pics will beat mine for sure haha! Grilled shrimp is just perfect! What BBQ/Grill do you use? Hahaha thanks Simon. We have a Napoleon gas BBQ. If you want the exact model number, let me know and I’ll find it!